The program was established in loving memory of Harjit Kaur Sidhu (nee Gill), devoted wife, mother, and strong advocate for education, Punjabi culture and language, and women’s issues. Every year, the program features a keynote address by a distinguished scholar, awards for local writers and student-contest winners, and student performances. 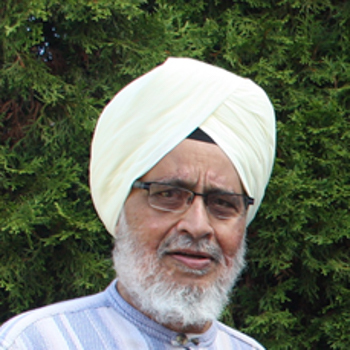 In alternating years, the book/writer award either honors a BC-based Punjabi-language writer with a “lifetime achievement award,”or a “best book” published in recent years by a writer from the region. The Tenth Annual Harjit Kaur Sidhu Memorial Program was held 2-4 March 2018. It was held at a larger scale than usual this year with the support of additional partners: the Dean of Arts Office, the Centre for India and South Asia Research, the Peter Wall Institute for Advanced Studies, the Department of Theatre and Film at UBC, & the Dr. Hari Sharma Foundation/Gursharan Singh Memorial Lecture. 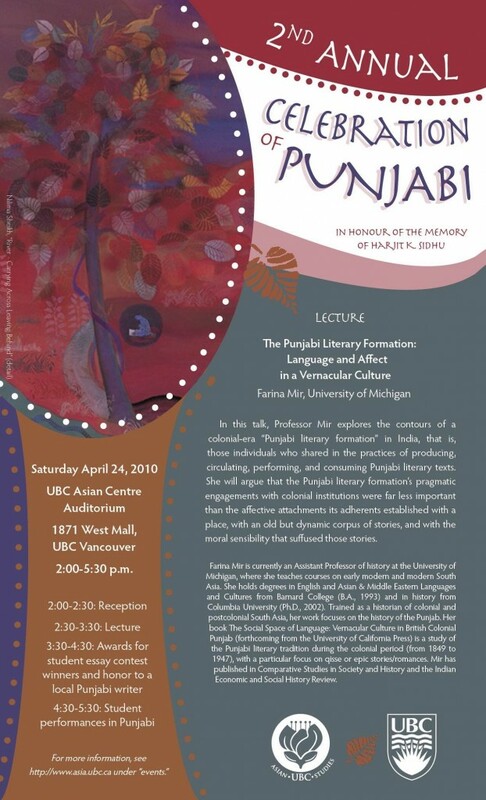 The three day program, organized by Anne Murphy, Sukhwant Hundal and Sarbjit Randhawa, hosted Gurvinder Singh, award-winning Punjabi-language filmmaker, for a series of film screenings and conversations. 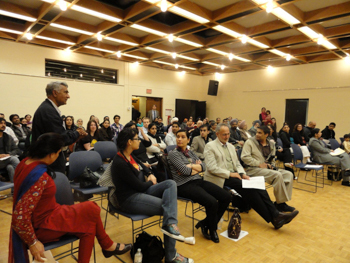 The first screening took place at UBC West Point Grey, with a screening of the film "Awaazaan" (2016) about UK-based Punjabi language poet, Amarjit Chandan. This was attended by a community audience as well as attendees at a conference organized by the Centre for India and South Asia Research, the South Asia Conference of the Pacific Northwest, 2-3 March 2018. 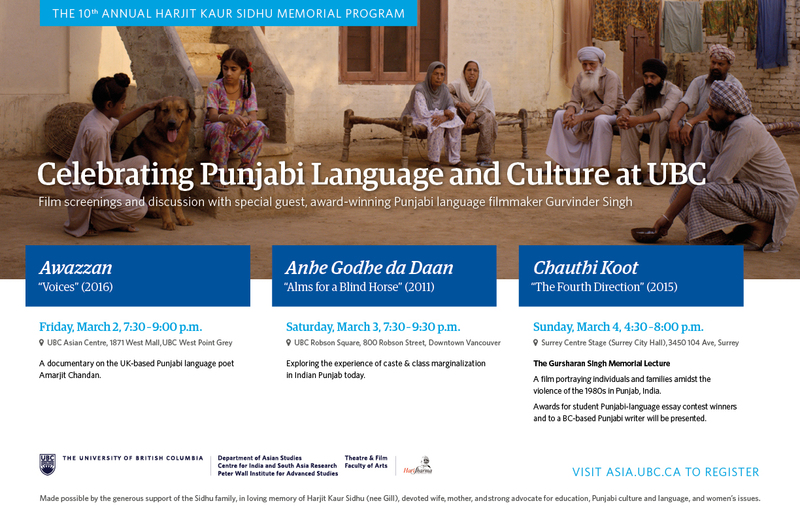 On Saturday, March 3, we held a screening at UBC Robson Square of the film "Anhe Godhe da Daan (Alms for a blind horse)" (2011), which portrays caste and class marginalization in the Indian Punjab today. The film featured a good showing of students, film buffs, and those interested in the content of the film, including Jai Birdi of the Chetna Association. 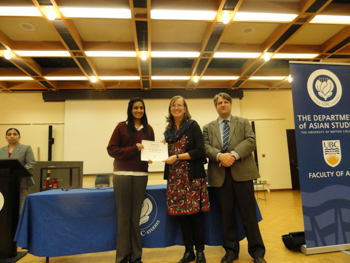 On Sunday, we had our main event in Surrey, where we awarded Inderjeet Kaur Sidhu, a local Punjabi language author, with a lifetime achievement award, and gave awards to students in our annual essay contest. 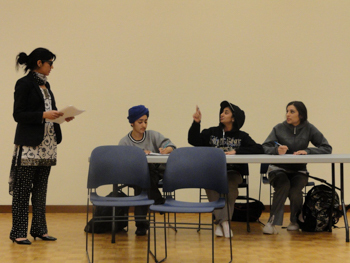 Students from Dasmesh School Abbotsford, Khalsa Secondary School, and UBC participated. At that event, we screened "Chauthi Koot, (Fourth Direction)" (2015) a haunting film that explores the violence of 1984 for individuals and families in the Indian Punjab. 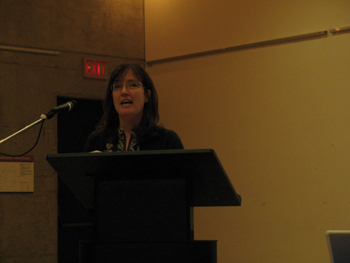 The University of Toronto also supported these events in part, because they held a screening of the latter film in Toronto, after the events here came to an end. From left to right: Sucha Singh Claire, Anne Murphy, award winner Inderjeet Kaur Sidhu, Nadeem Parmar and Sarbjit Randhawa. The Harjit Kaur Sidhu Memorial Program was established in memory of Harjit Kaur Sidhu (nee Gill), a devoted wife and mother, and a strong advocate for education, Punjabi culture and language, and women’s issues. 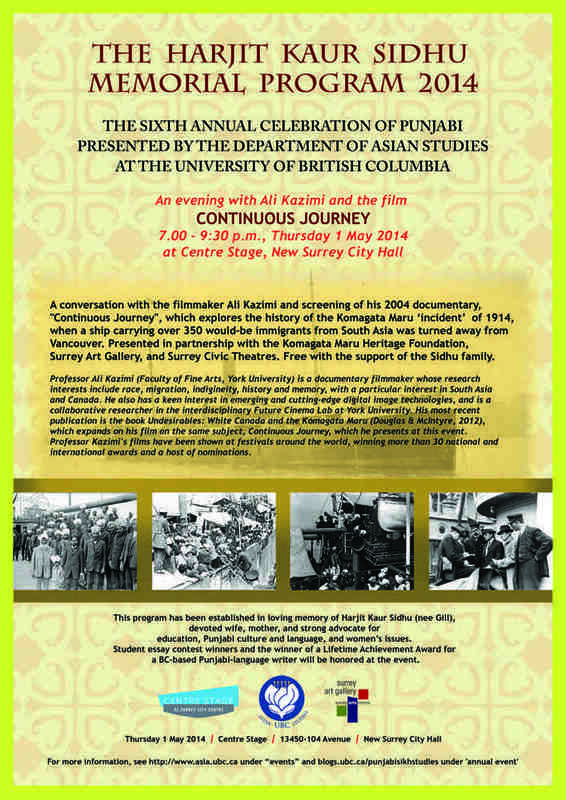 The program celebrates the long and vibrant life of Punjabi in BC, with the generous support of the Sidhu family. In 2017, we welcomed Samuel John, award-winning actor and theatre activist, back to UBC to perform for the public. 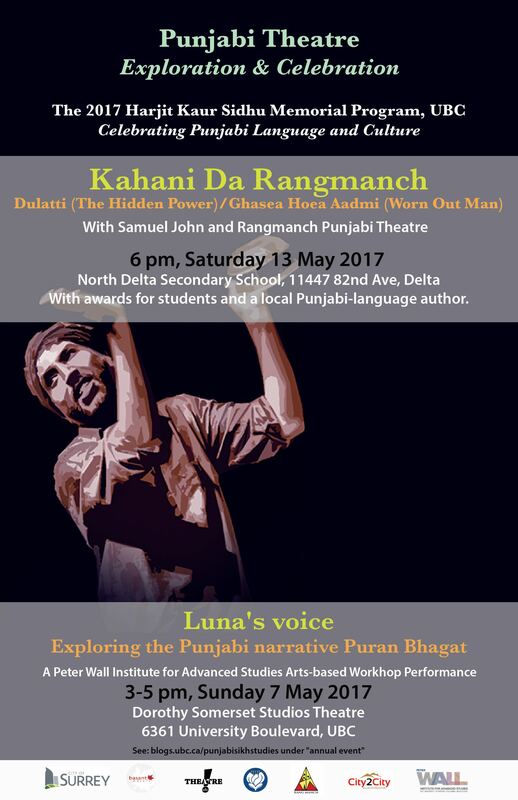 Hundreds of Punjabi language enthusiasts gathered in North Delta to watch Mr. John’s performance, in collaboration with Rangmanch Punjabi Theatre, of two works in Punjabi: “Dulatti” (The Hidden Power) and “Ghasea Hoea Aadmi” (Worn Out Man). In keeping with the Sidhu Program tradition, we honoured a local Punjabi writer at the event, as well as student winners of a Punjabi language essay contest. This year’s winner of the lifetime achievement award for a BC-based Punjabi writer was Nadeem Parmar, a local writer and community historian. 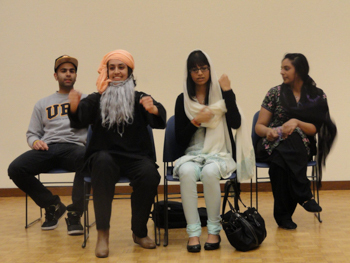 Mr. John was also a key part of a theatrical workshop held prior to the Sidhu program at UBC entitled “Luna’s Voice: Restaging a traditional Punjabi narrative in the Lower Mainland,” which was funded by an Arts-based Workshop grant from the Peter Wall Institute for Advanced Studies at UBC. 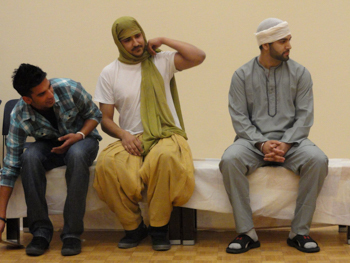 The workshop made it possible to bring together Mr. John, Sohil Bhatia (a performance artist based in New Delhi), and BC-based Punjabi language and/or Punjabi culture based theatre artists to explore ways of reimagining a traditional Punjabi narrative in British Columbia, building on prior reimaginations of the narrative in Punjabi literature. 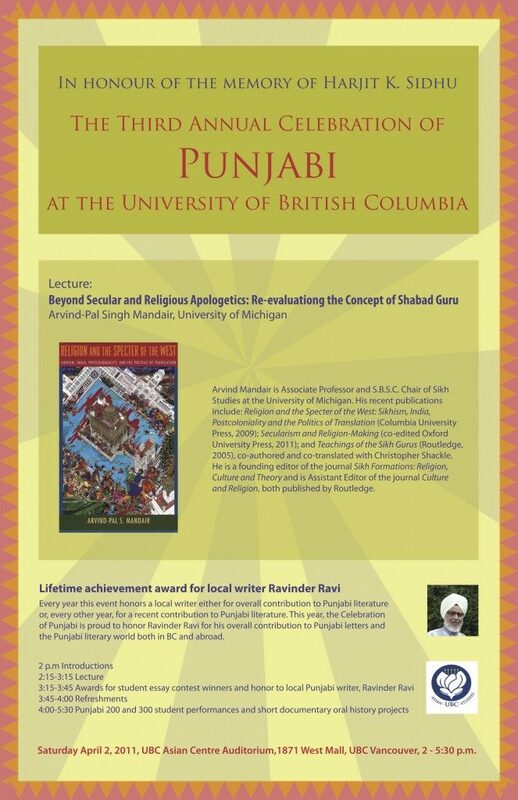 This year the UBC community gathered to hear a short talk on the early twentieth century revolutionary Ghadar movement, which sought to establish a free and secular India and an end to British colonial rule, by Sunit Singh (University of Chicago); present awards to student winners in a Punjabi-language essay contest; honour BC-based Punjabi-language author Jarnail Singh Sekha with a life-time achievement award; and view performances in Punjabi by students in Punjabi 200 and films by students from ASIA 475, “Documenting Punjabi Canada.” The event was well attended by students and members of the community. 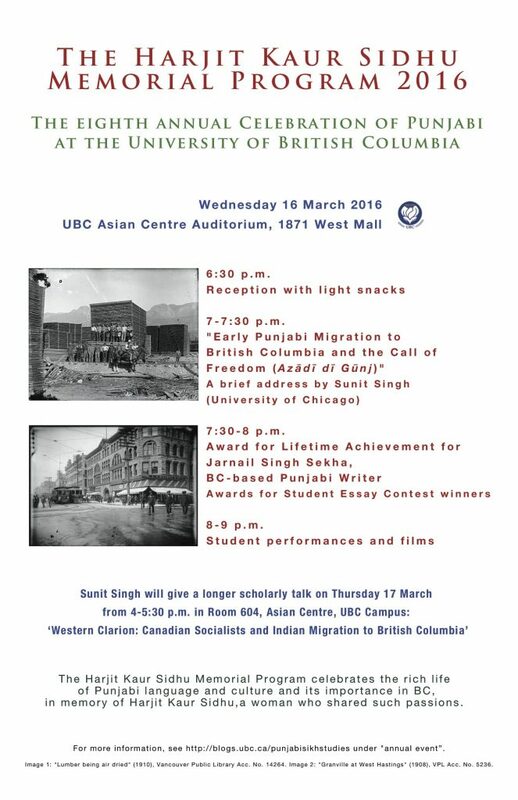 Dr. Singh also gave a separate scholarly talk entitled "Western Clarion: Canadian Socialists and Indian Migration to British Columbia" in the Department of Asian Studies, which was also well attended by faculty and students. with Sunit Singh (University of Chicago). 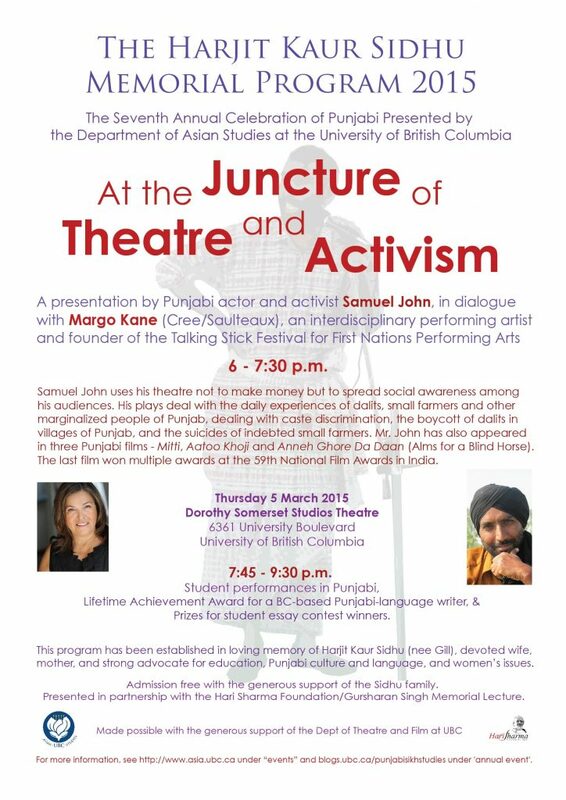 The 2015 program featured a presentation by Punjabi actor and activist Samuel John, in dialogue with Margo Kane (Cree/Saulteaux), an interdisciplinary performing artist and founder of the Talking Stick Festival for First Nations Performing Arts. 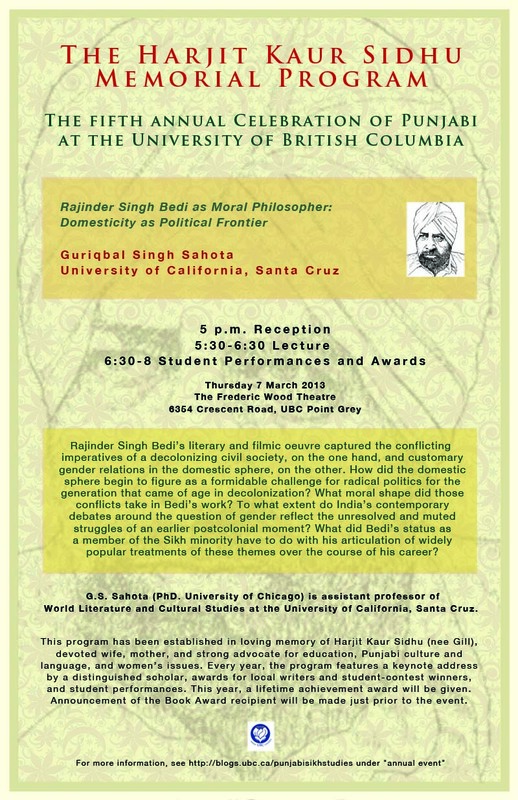 Held at the Dorothy Somerset Studios Theatre at UBC on Thursday March 5, 2015, the Sidhu program for 2015 was presented in partnership with the Hari Sharma Foundation/Gursharan Singh Memorial Lecture, and made possible with the generous help of UBC’s Department of Theatre and Film. Former UBC Punjabi instructor Sadhu Binning received the writer's award for this year, in honour of his tremendous contribution to Punjabi language education, advocacy, and literature in British Columbia. Our 2014 Harjit Kaur Sidhu Memorial Program featured “An evening with Ali Kazimi and the film “Continuous Journey” (2004)” at the New Surrey City Hall on Thursday May 1, 2014. 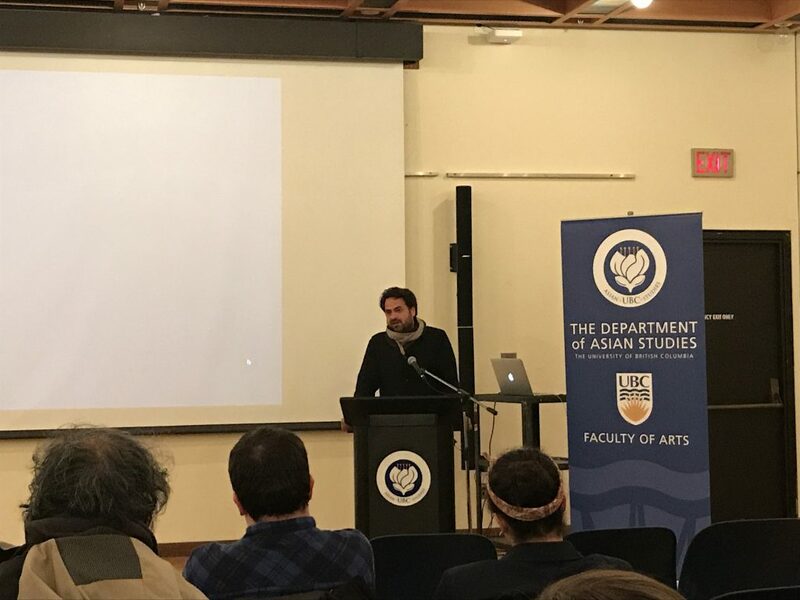 The event featured a conversation with the filmmaker Ali Kazimi and screening of his 2004 documentary, “Continuous Journey”, which explores the history of the Komagata Maru ‘incident’ of 1914, when a ship carrying over 350 would-be immigrants from South Asia was turned away from Vancouver. 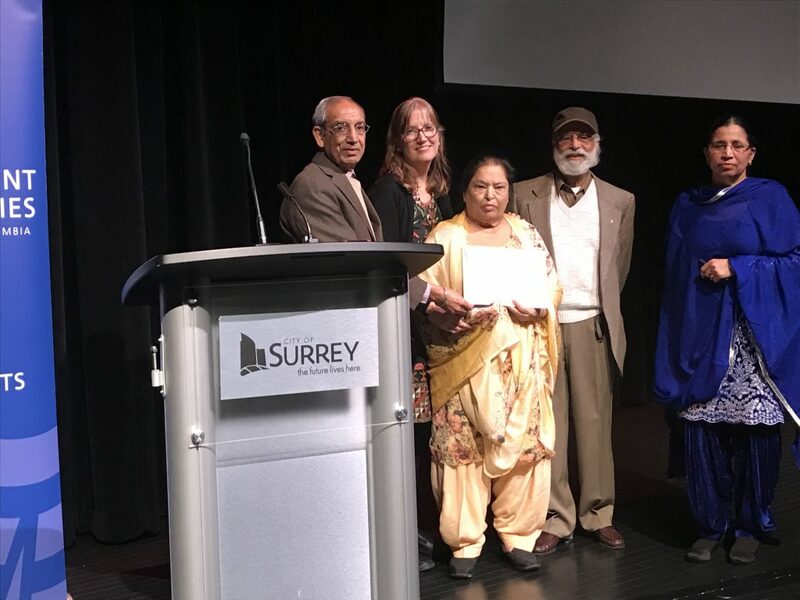 It represented a partnership with the Komagata Maru Heritage Foundation, Surrey Art Gallery, and Surrey Civic Theatres, as a part of a major region-wide commemoration of the centenary of the Komagata Maru incident in the summer of 2014. 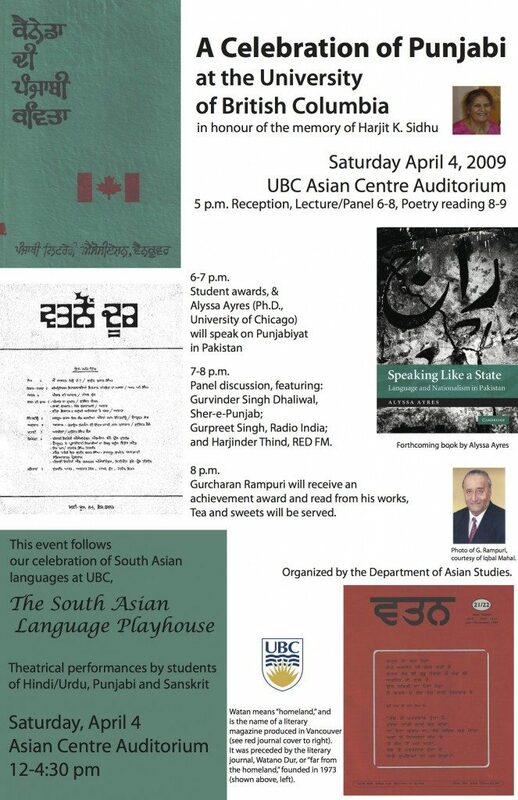 It also formed the opening component of our Komagata Maru Project, which was comprised of a series of theatrical productions (May 3-4 2014 at UBC and May 9 in Surrey) of Canadian plays in Punjabi and English about the Komagata Maru incident, and a related symposium on theatre and the postcolonial at UBC (May 3 2014). 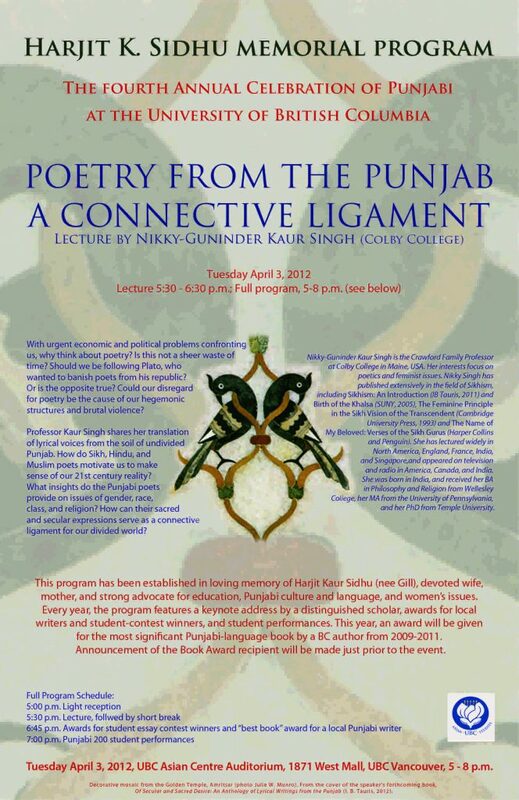 Well-known writer Surjeet Kalsey was awarded the Harjit Kaur Sidhu Writer’s award in 2014, in recognition of her profound contribution to Punjabi language literary production, and in particular for her attention to gender issues in broad terms, and her efforts to bring Punjabi-language and Punjabi-influenced materials to a wider English-speaking audience through translation and new work written in English. A symposium associated with the theatrical and scholarly program "Performing the Komagata Maru: Theatre and the Work of Memory." Featured a panel discussion by the playwrights of the plays included in the program (Sadhu Binning, Sukhwant Hundal, Sharon Pollock, Ajmer Rode), talks by Rahul Varma (playwright and founder of Teesri Duniya Theatre or "Third World Theatre"), Nandi Bhatia (University of Western Ontario), and filmmaker and York University Professor Ali Kazimi. We commenced with a key-note address by Professor of English at Panjab University, Chandigarh and well-known translator of modern Punjabi literature, Rana Nayar. 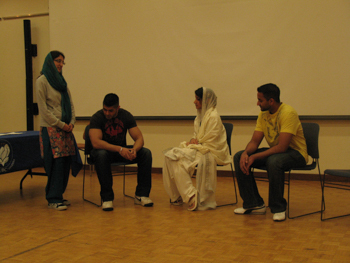 This performance event explored three plays written about the Komagata Maru incident by Canadian authors: Sadhu Binning and Sukhwant Hundal’s “Sumundari Sher nal Takar” (in Punjabi), Sharon Pollock’s “The Komagata Maru Incident” (in English), and Ajmer Rode’s “Kamagata Maru” (in Punjabi). 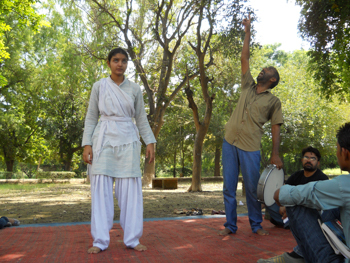 We developed a single program that integrated sections of the three plays to explore how and why we remember the Komagata Maru, and how the creative arts augment and enhance the traditional historical archive. 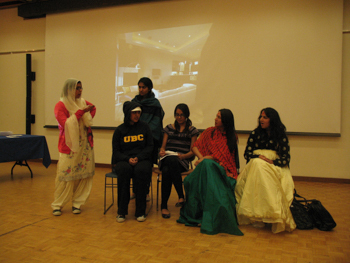 Students in the Department of Theatre and Film at UBC performed short selections from Pollock’s play; members of the theatre group “Rangmanch Punjabi Theatre” performed selections from the two Punjabi plays. 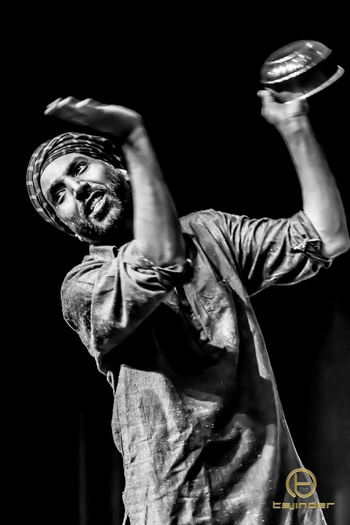 The event was entirely bilingual through the use of Surtitling, and sets for the production were produced by students from Srishti School of Art, Design, and Technology in Bangalore in association with artist and Rangmanch Punjabi Theatre member, Raghavendra Rao K.V. 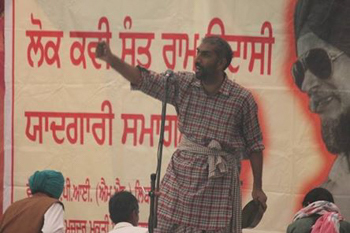 In 2013, we invited Guriqbal Singh Sahota, now Associate Professor at the University of California, Santa Cruz. 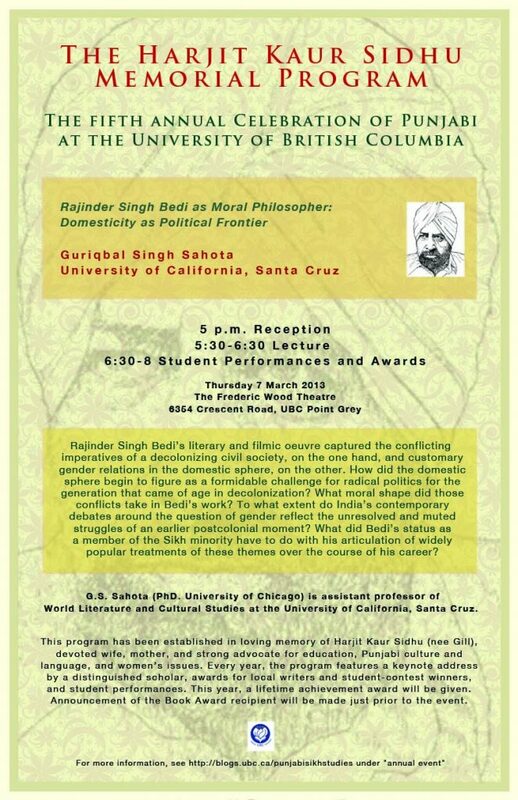 Sahota spoke about how Rajinder Singh Bedi’s literary and filmic oeuvre captured the conflicting imperatives of a decolonizing society, on the one hand, and customary gender relations in the domestic sphere, on the other. 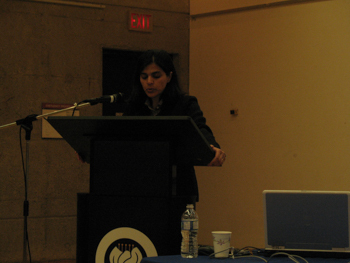 Professor Sahota addressed the following questions: How did the domestic sphere begin to figure as a formidable challenge for radical politics for the generation that came of age in decolonization? What moral shape did those conflicts take in Bedi’s work? To what extent do India’s contemporary debates around the question of gender reflect the unresolved and muted struggles of an earlier postcolonial moment? What did Bedi’s status as a member of the Sikh minority have to do with his articulation of widely popular treatments of these themes over the course of his career? Prominent poet, playwright, and critic Ajmer Rode received the Writer's Award for his overall contribution to Punjabi literature. 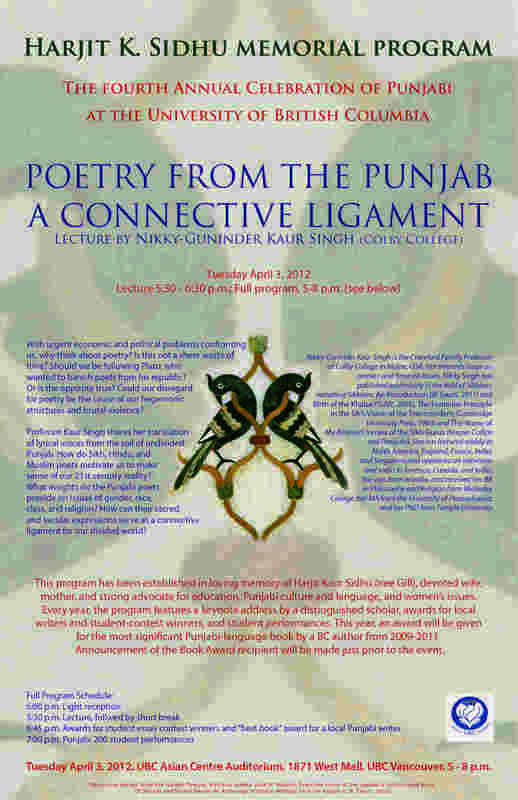 In 2011, our guest was Arvind-pal Singh Mandair of the University of Michigan, whose presentation focused on the secular commitments of modern Punjabi literature, with the suggestion that the religious/secular binary--which is so central to the imaginary that has fed modern Punjabi literature--itself does violence to the ethos of Punjabi literature overall, which exceeds such a distinction. The enforcement of this distinction ends only in alienating the religious, he argued, setting up false opposition between religious and secular modes of being. This year the Writer/Book Award was granted to 2011 renowned playwright Ravinder Ravi, for lifetime achievement. 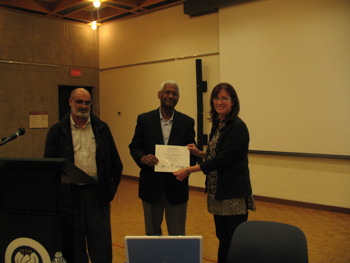 We opened our program in 2009 with Alyssa Ayres (Ph.D. University of Chicago) who is now with the Council on Foreign Relations and formally the US State Department, who spoke on "Punjabiyat"--or, a Punjabi cultural and literary ethos--in Pakistan. She argued cogently that advocacy that is visible in Pakistan for the Punjabi language demonstrates a need for a reconfiguration of the generally accepted scholarly formulation of the direct relationship between state formation and language politics. 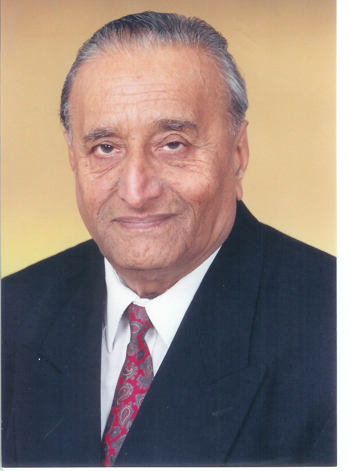 The first recipient of our Writer/Book Award was granted in 2009 to Gurcharan Rampuri for his lifetime achievement in Punjabi letters. 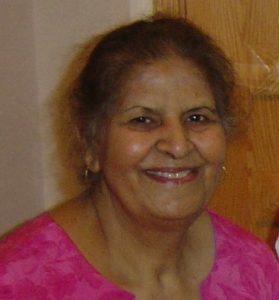 Harjit Kaur Sidhu (nee Gill) was a devoted wife and mother, and a strong advocate for education, Punjabi culture and language, and women’s issues. Mrs. Sidhu was born in Amritsar in 1937. She grew up in what is now Pakistan and resettled with her parents, brothers and sisters in Ludhiana after partition. She received both an MA and MEd. She went on to lecture at Sidwa College in 1966 and 1967. She immigrated to Canada with her husband, Balvindar Singh Sidhu, in 1968. The couple lived in the Yukon for 32 years, during which time Mrs. Sidhu’s passion became early childhood education. After the birth of her sons Ravindar (1971) and Rajvindar (1972), she worked as a teacher in multiple early childhood settings: preschool, prekindergarten programs and in kindergarten. 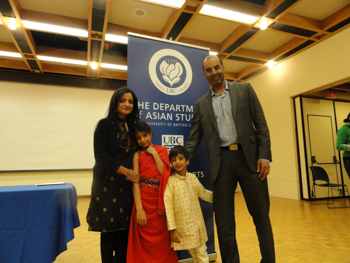 In 2001, Harjit and Balvindar moved to Vancouver where there youngest son was a practicing dentist and where, later, their oldest son started a career at UBC as a surgeon in the Faculty of Medicine. During her time in Vancouver, Harjit rediscovered her passion for Punjabi language and culture. She was a strong advocate for Punjabi culture, and for women in Punjabi society. After two and a half year courageous battle with cancer, she passed away in her home on July 23, 2007. She is survived by her husband, two sons and their wives, two grandsons and one granddaughter.